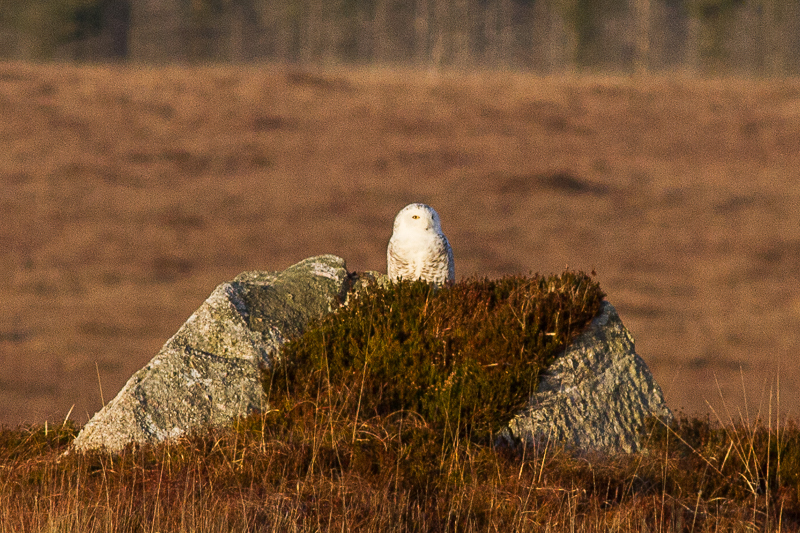 I placed a trail camera on one of the female Snowy Owl's favourite boulders that it perches on to see if I could establish any sort of a routine in the birds movements. Bit of a disaster as is most often is the case when using my own particular trail camera. The first time I put it out I set it up to take video and pictures at regular intervals. Unfortunately I set the video length at 30 seconds length so this combined with a small memory card resulted the card rapidly filling in just a couple of hours! 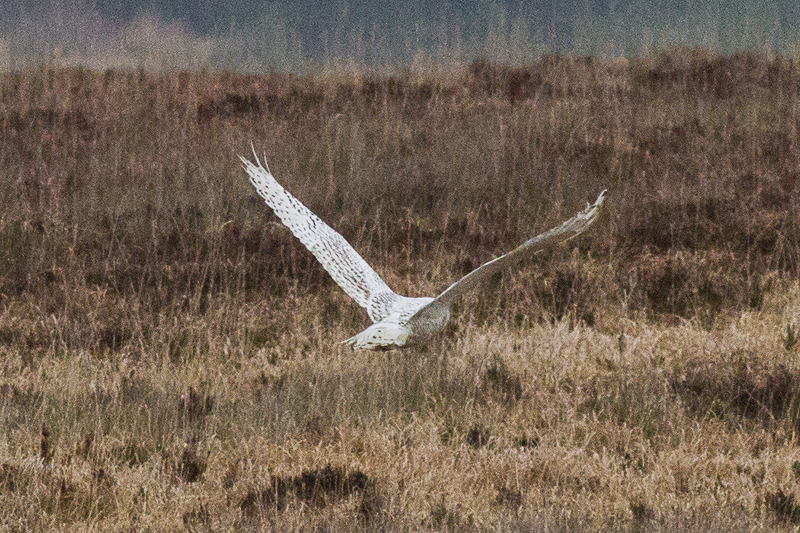 I changed the memory card for a bigger one the next time I was in there and moved its position as all the pictures came out completely overexposed, so much so that you couldn't make out the bird. The second time round I still had the same problem and after nearly three weeks out there it only took one photo! 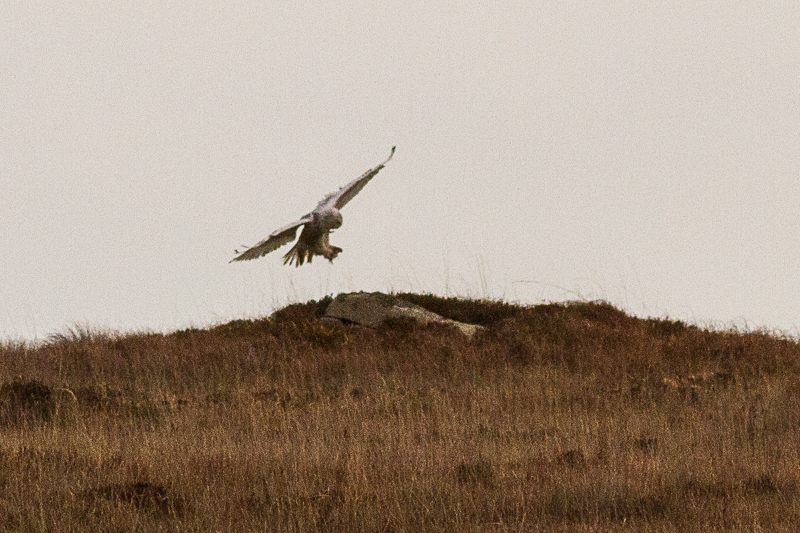 I've previously noted that my camera can be very unreliable at picking up movement and firing, really frustrating! While setting up the trail camera and resetting it I didn't see the bird in the field on either occasions. I went in on Tuesday to collect the camera and there was still no sign of the bird however there were some fresh droppings on the boulder along with the first pellet I've found from her. Will have to hand it over to someone who knows what they are looking at to try and see what she is living on out there. 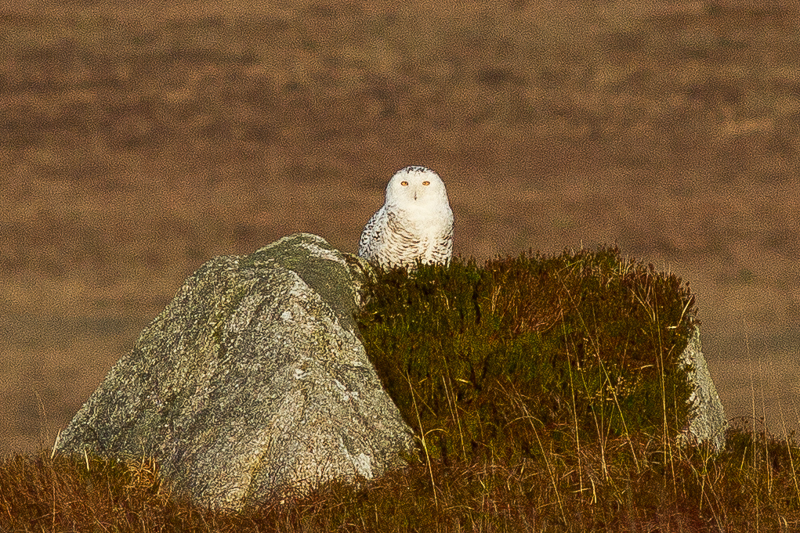 I spend about three hours out there yesterday and the only birds I saw during that time were a pair of Stonechats, a pair of Red Grouse (lots on droppings on big boulders, must be collecting smalls pieces of grit to aid digestion), a flyover Kestrel, a pair of Hooded Crows and a flock of nine Golden Plover. 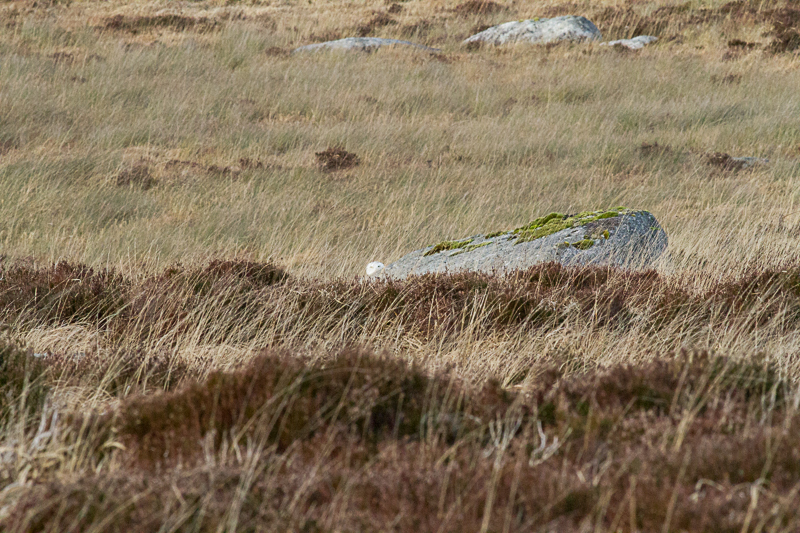 I wouldn't think there's a great density of rodents out there especially on the wet blanket bog. 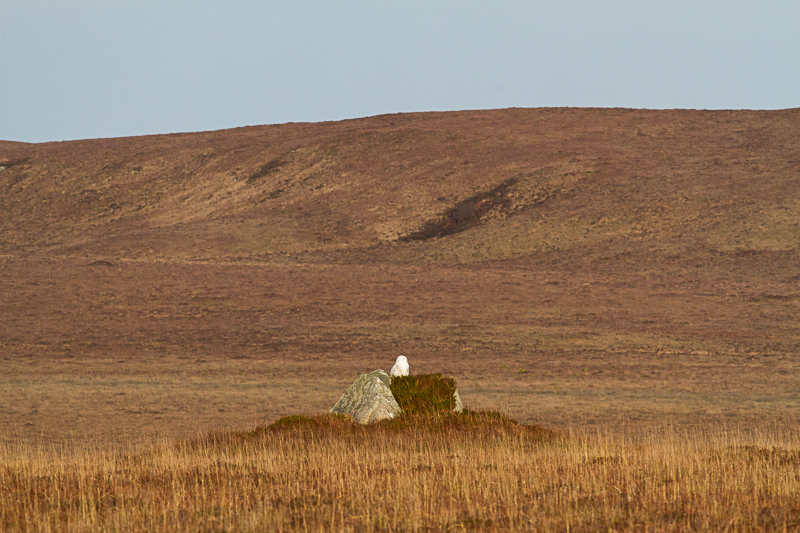 I took a wander around the other side of the hill where there was another collection of granite boulders. Just as I came around the side of the hill I spotted her head. I had to move slightly to get her in full view. 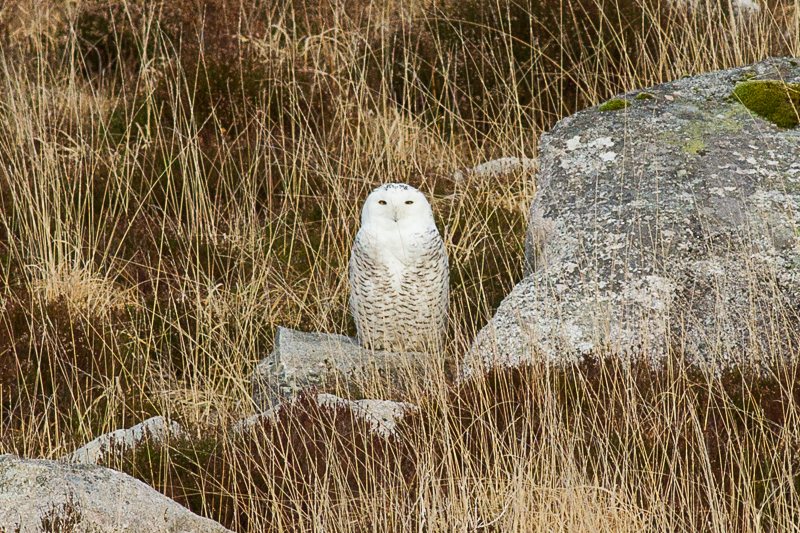 She was probably only a hundred metres away from me but wasn't too concerned by my presence. 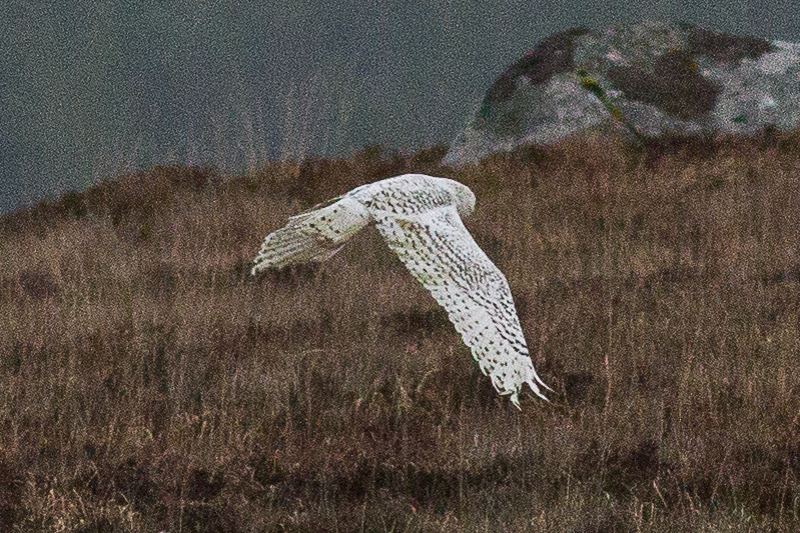 She moved off after a half an hour just before an incoming rain shower arrived. It's a huge area up there so it's not at all surprising how difficult she can be to spot at times. 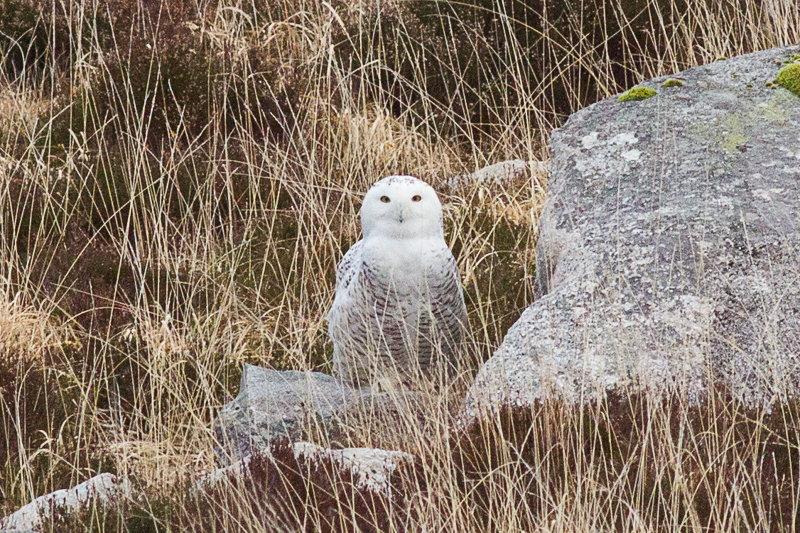 Snowy Owl, Connemara, Ireland, 1st January 2017 from Dermot Breen on Vimeo. 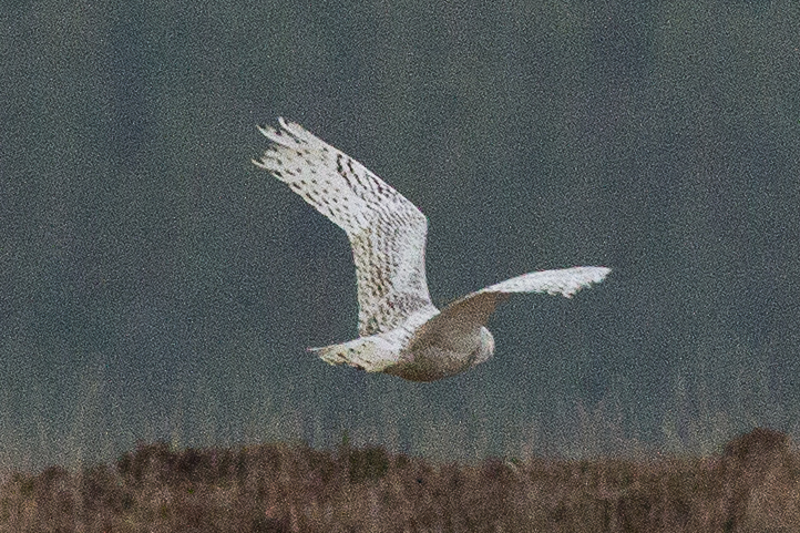 First view of the bird on Tuesday. 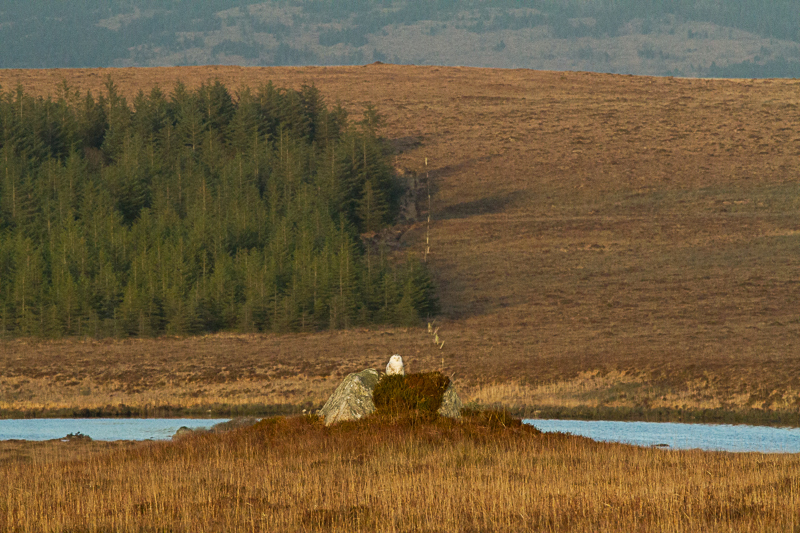 About as close as you are going to get to tundra in Ireland. 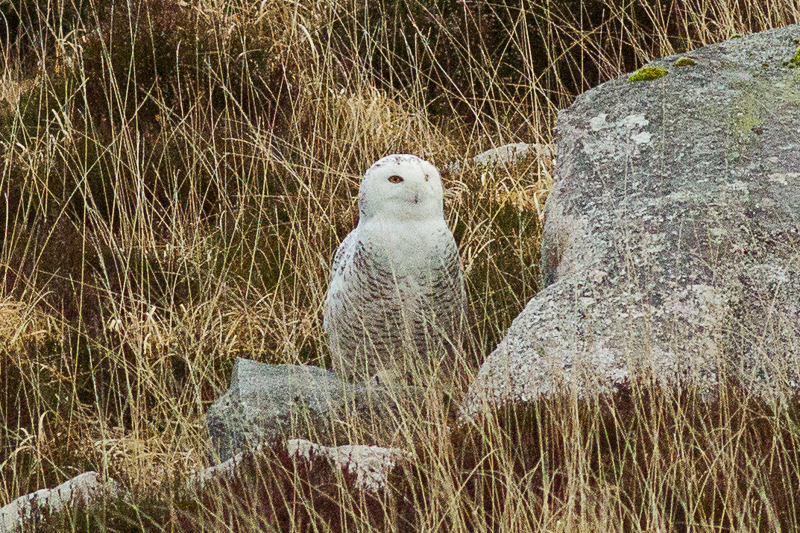 Snowy Owl, Connemara, Ireland, 31st January 2017 from Dermot Breen on Vimeo. 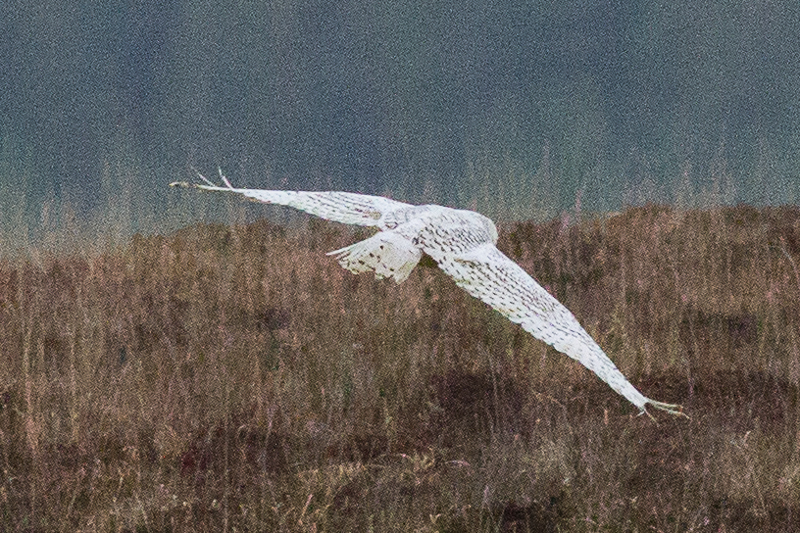 Snowy Owl droppings and feather. 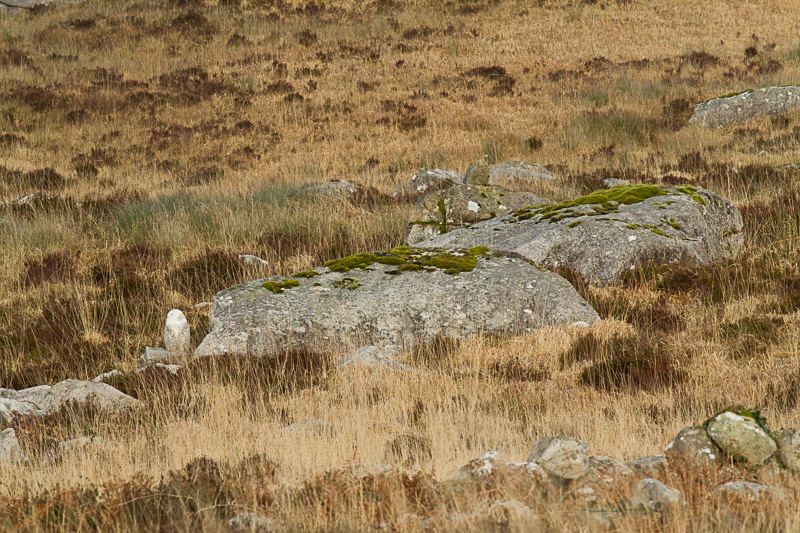 Snowy Owl Boulder no. 1. 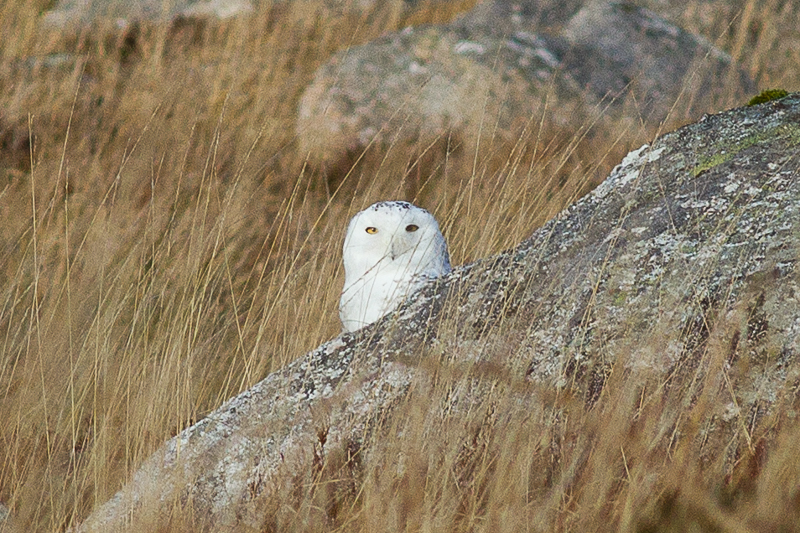 Snowy Owl Boulder no. 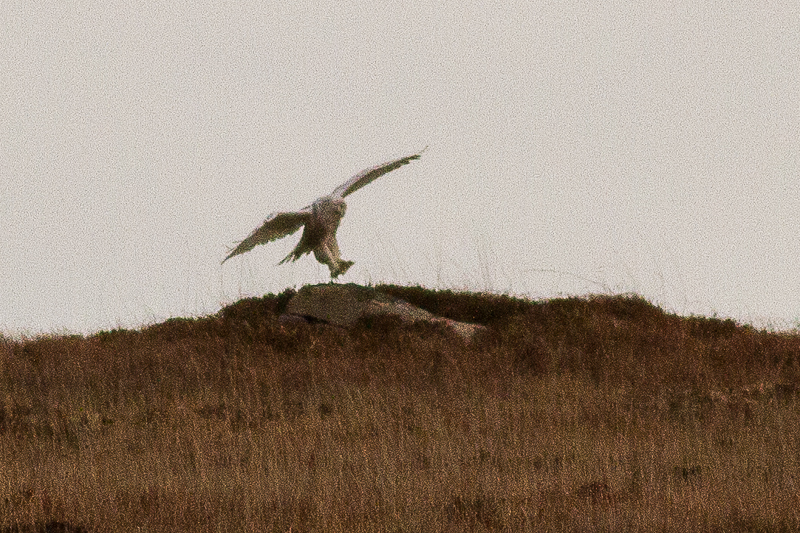 2, it was sitting up on the smaller rock immediately to the left of the large boulder.